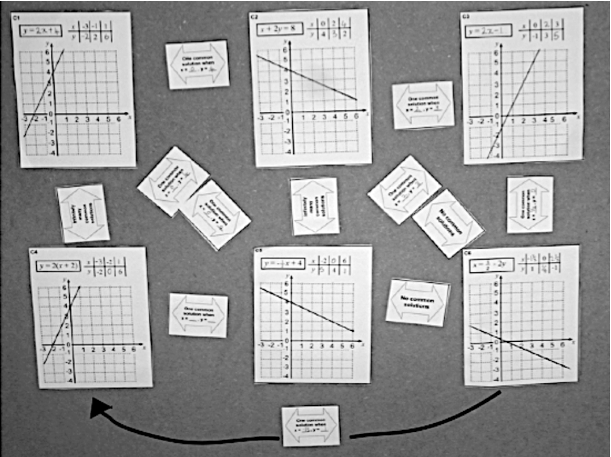 Classify solutions to a pair of linear equations by considering their graphical representations. Use substitution to complete a table of values for a linear equation. Identify a linear equation from a given table of values. Graph and solve linear equations. Before the lesson, students attempt the assessment task individually. You then review students’ solutions and formulate questions that will help them improve their work. During the lesson, students work collaboratively in pairs or threes, plotting graphs, completing tables of values and deducing equations. Then, based on the number of common solutions, students link these representations. In a follow-up lesson, students receive your comments on the assessment task and use these to attempt the similar task, approaching it with insights gained from the lesson. Each student will need a copy of the assessment tasks Working with Linear Equations and Working with Linear Equations (revisited), a mini-whiteboard, eraser, and a pen. Each group of students will need cut up Card Set A: Equations, Tables & Graphs, two cut up copies of Card Set B: Arrows, one copy of Graph Transparency, copied onto a transparency, a transparency pen, a large sheet of paper for making a poster, some plain paper, and a glue stick. Provide rulers if requested. There are some projector resources to support whole-class discussion. 15 minutes before the lesson for the assessment task, a 80-minute lesson (or split into two shorter lessons), and 15 minutes in a follow-up lesson (or for homework). All timings are approximate. 8.F: Define, evaluate, and compare functions.